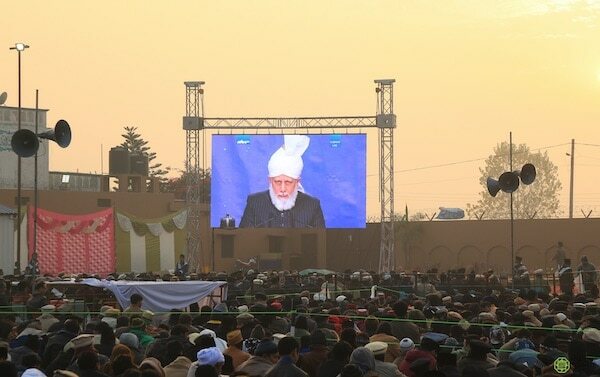 Having an historic relationship with the institution of Jalsa Salana, The Review of Religions is proud to feature some selected highlights of the recent Jalsa Salana in Qadian. The attendance peaked at a humble 75 devotees at the first ever Jalsa Salana. The hearts of the attendees were large but their finances minuscule. Travel facilities were scarce and uncomfortable. Accommodations and arrangements were made possible only through the most exemplary sacrifices, often by Hazrat Mirza Ghulam Ahmadas himself. But the call to this spiritual convention began moving more hearts and slowly but surely, the secluded settlement in the rural Punjab began hosting passionate crowds in the thousands. The convention encapsulated a complete spiritual refresher course for members’ moral training. Strengthening sentiments of love and community on one side and reviving their relationship with their Creator on the other. 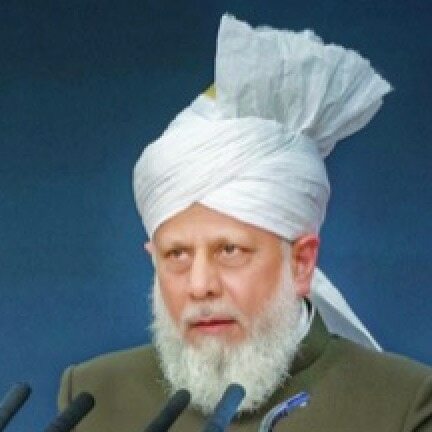 Over a century later, the Ahmadiyya Muslim Community, guided by its worldwide spiritual head in the form of Khilafat [Caliphate], keeps shining the very same spiritual torch of the Jalsa Salana that Hazrat Mirza Ghulam Ahmadas had lit. 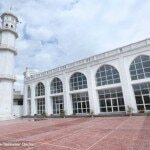 This year, as it has for over a hundred years, the township of Qadian once more hosted Jalsa Salana on the 28th, 29th and 30th of December 2018, marking the 124th anniversary since its inception. Preliminary preparations had commenced months before the event. A volunteer inspection by the highest office bearer present, Head of Sadr Anjuman Ahmadiyya Qadian, on the 24th of December finalised the operational administration workforce. A far cry from that first humble gathering of 75, the organisational structure today must handle everything from the setup of the venue, necessary legal clearances for the event, a comprehensive program for three days and complete accommodation, food arrangements and necessary transportation for the nearly 19,000 guests who arrived from 48 different countries. A view of the live broadcast of the concluding session of Jalsa Salana transmitted from London. The traditional raising of the Liwa-e-Ahmadiyyat [the official flag of the Ahmadiyya Muslim Community] and silent prayer at 10:00 am in the morning marked the beginning of the first day’s proceedings. 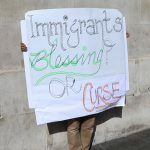 The three days were split into six short sessions containing almost a dozen speeches on a variety of religious subjects richly enlightening the audience. With a sizeable attendance of non-Ahmadi guests and dignitaries, the next day’s program was themed around ‘Religious Leaders Day’. Amply reflecting the theme, the address delivered by the Ahmadi Muslim representative was titled ‘Love for All, Hatred for None’. This was followed by a series of short discourses by dignitaries and other religious leaders who equally shared their vision of universal compassion and inter-religious harmony. To the pleasant benefit of the attendees and guests, an exclusive exhibition by the title of Islam, World Peace was running parallel to the Jalsa. 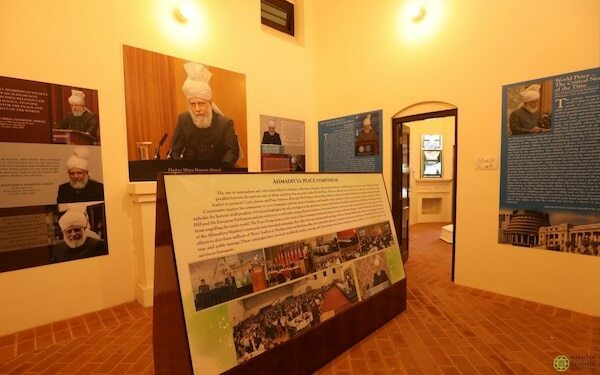 The exhibition, using large and colourful posters, elaborately presented the peaceful teachings of Islam and the tireless efforts of His Holiness, Hazrat Mirza Masroor Ahmadaba, the worldwide head of the Ahmadiyya Muslim Community, for the cause of global peace. However, every Ahmadi attendee knows the first two days are only the preamble culminating to a climax on the third day. 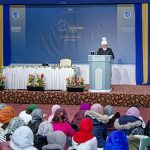 For almost a decade now, every final session of Jalsa Salana Qadian has been concluded with a live, parallel session simultaneously broadcast from Qadian, India, and London, UK, in the venerable presence of the worldwide spiritual head of the Ahmadiyya Muslim Community. 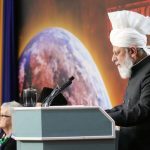 The final address of the entire convention is wholly the words and will of His Holiness, Hazrat Mirza Masroor Ahmadaba. For an Ahmadi Muslim, the session is one not to miss. The massive screens in the seating area showing live scenes of their beloved leader addressing them from thousands of miles away, the auditory rush of powerful slogans traveling as enormous waves across continents and back through the live telecast paired with the very thought that their declarations of devotion are the prophetic fulfilment of a once unknown and humble servant of God are enough for most eyes to water. Silent prayer followed the address. After the prayer, selected groups of reciters representing various cultures were given short moments to present emotional poems expressing their unwavering love for Khilafat. As the last group finished, His Holiness waved his hand to the fervent audience on the other side of the globe signalling goodbye. In reply to it, thousands of hands instantly arose across the enormous seating area intensely waving back with tears of gratitude. 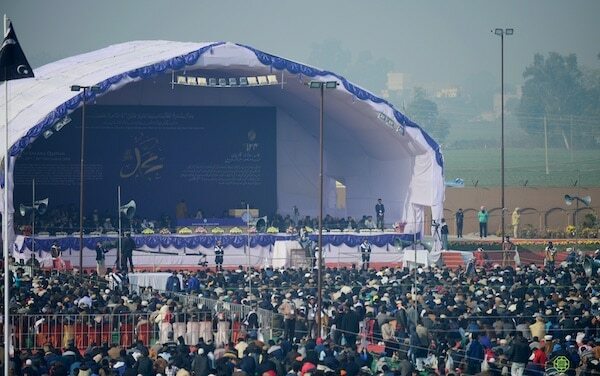 Jalsa Salana Qadian had officially come to a close. The incredible success and expansion of the Jalsa to the remotest corners of the planet is a profound fulfilment of that initial desire the Promised Messiahas had so fervently expressed in Qadian over a century ago. 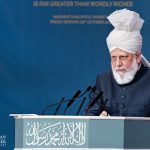 From enormous crowds in open air conventions in Ghana, to the humble meeting at the local mosque of a few dozen in the Pacific Island of Tuvalu, to the millions who witness the live broadcast from Alton, United Kingdom when His Holiness addresses the entire world of Ahmadiyyat; the Jalsa has become a phenomenon truly global. A glimpse of the exhibition Islam, World Peace which displayed the efforts made by the community to establish world peace. The Review of Religions and Jalsa Salana – An Historic Link. It would also be of interest for the readers of The Review of Religions to learn that the idea to have an English magazine to propagate the message of Islam to the West was first proposed at the second Jalsa in response to the aforementioned objective set out by Hazrat Mirza Ghulam Ahmadas. Thus, The Review of Religions has an historic relationship with the institution of Jalsa Salana. With special thanks to the Office of Press and Media for the Ahmadiyya Muslim Jamaat India, who provided background and photographs for this report. 1. Hazrat Mirza Ghulam Ahmadas, The Heavenly Decree (Surrey: Islam International Publications Ltd., 2006), 74. 2. The Review of Religions, November 2002, p.9.